With my huge batch of cooked cassava chips, I wondered what else I could do. I considered making Aipim, a traditional Brazilian cake – dense, moist and apparently delicious. We, afterall share histories of food and more with them. However, I wasn’t sure my cassava was of the right texture, as it was in chunky chips as opposed to grated and so I decided to venture down a different path. That of a quick broth, flavoured with coconut and herbs, in which the chips got poached and then finished with a squirt of lime juice and crushed, roasted groundnuts. The Verdicthing? 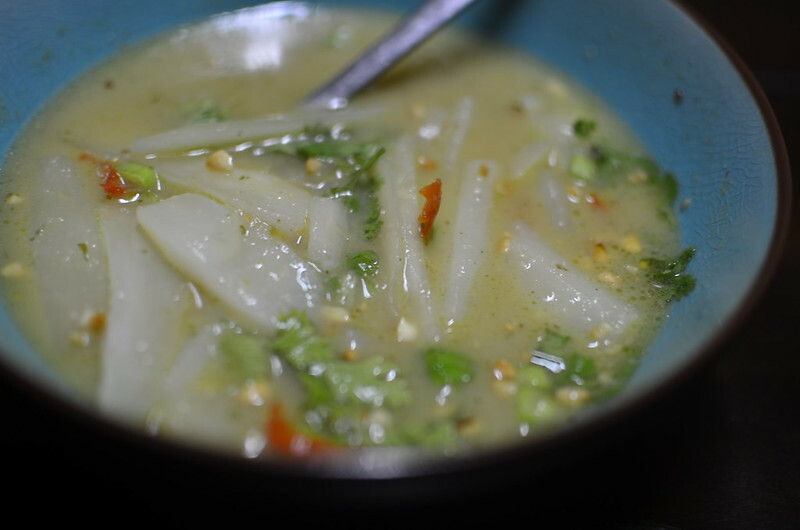 Think of it as a tropical broth with spice, where the cassava adds some bite and the peanuts, crunch. I’ll be repeating this often. Passionate about food in its entirety – cooking, eating, dreaming, writing and photographing it. ‘Traveller, by plate’, using foodways – the social, cultural and economic practices relating to the production and consumption of food to explore Nigerian cuisine & the world for ‘food is more than eating’. Kitchen Butterfly is a Winner!